NICCONI (AUS) (Bay 2005-Stud 2010). 6 wins-1 at 2, VRC Lightning S., Gr.1. Sire of 354 rnrs, 261 wnrs, 17 SW, inc. Nature Strip (MVRC Ian McEwen S., Gr.2), Faatinah, Sircconi, Chill Party, Nicoscene, Time Awaits, Concealer, Tony Nicconi, Hear the Chant, Niccanova, State Solicitor, Caipirinha, It's Been a Battle, Ayers Rock, Quatronic, Exclusive Lass, Loved Up, SP Akkadian, Shokora, Fickle Folly, Bolero King, Nieta, Caesour's Dream, Niccolance, etc. SPECIAL ALERT (f. by Not a Single Doubt). 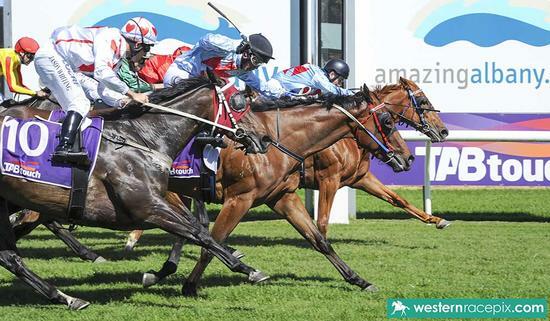 2 wins at 1500m, 2400m, A$187,990, in 2017-18, Western Australian Oaks, Gr.3, WATC Tabtouch P., 2d WATC Perth Racing Club Membership H., 3d WATC Lycopodium Limited H., 4th WATC Champion Fillies S., Gr.3. Truly Gold (g. by Nicconi). 5 wins from 1300m to 2050m, A$88,180, to 2016-17 in Aust. Truly Rare (f. by Nicconi). Winner. See below. Jeune's Reign (Jeune). 7 wins from 1300m to 2500m, A$172,620, VRC Roy Higgins Quality H., Konica Minolta H., SAJC Proformkitchens.com.au H., Young Members H., Minster Carpets H., 2d SAJC Rain Lover P., Gr.3, Honda CRV H., Yallambee Stud H., Malaysia Airlines H., 3d SAJC Rain Lover P., L, Distinctive Homes H., All New Jeep Compass H.
Clean Sweep. 5 wins from 1400m to 2000m, HK$3,974,800, HKJC Tak Wah H., Fairy King Prawn H., Sasa Beauty H., Ma Wan H., Kunming H., 2d HKJC Cheung Sha H., Ruby H., Jiangxi H., Lung Hang H., Success Partners H., 3d HKJC Dublin H., HKU Jockey Club Student Villages H., Yuen Long H., Lucky Star P.
Truly Special. 3 wins. See above. Bon Vacance. 2 wins at 1100m, 1300m in Aust. Lucky Lucky Eight - Reine Dasher (Sing.). Winner at 1250m in 2016-17, SAJC Quayclean P., 2d Singapore TC Class 4 H., 3d Singapore TC Class 4 H.
Reine Happy. 6 wins to 1300m, A$96,765, to 2017-18 in Aust. June Three. 8 wins from 1200m to 1600m to 2018 in Philippines. My Cousin Rhett. 5 wins-1 at 2-from 1000m to 1600m, A$84,695, to 2017-18 in Aust. REIGNING BELLE (Military Plume). 5 wins. See above. Cocktail Evening. 2 wins-1 at 2-at 1200m, 1250m, MRC Shankhill Lass H., 2d MVRC Concept Sports International 2YO P., Business Network Luncheon 2YO H., 4th MRC Quezette S., L. Producer. Sadaqa. 8 wins from 1300m to 1800m, A$478,040, to 2016-17, VRC Crown Resorts P., Long Tan H., MRC Bravo Greg Miles H., Swettenham Stud Summer Championship Heat 8 H., 2d VRC Japan Racing Association Trophy H., MVRC Craig Opie Cup, Travis Harrison Cup-twice, VRC AVHPA Vic Trophy H., Western Health Foundation H., MVRC Sweeney Estate Agents H., 3d VRC Melbourne Cup Carnival on Sale H., Chairman's Club H.
Aladah. 6 wins-1 at 2-to 1200m, A$141,000, SAJC Schweppes 2YO H., BRC SITA Environmental H., Greg Grant H., 2d BRC Madison Cleaning Services H., 3d BRC Ormiston College H., Austcover H.
DANAIDES (Rory's Jester). Winner at 2, VATC Blue Diamond Prelude, Gr.3, 2d VATC Bounding Away H., L. Producer. Ansami (Ashkalani). Winner at 1500m, VATC Heirloom H., 3d SAJC Adelaide Guineas, Gr.3, VRC Great Western H., L. Producer. THE HUNTRESS (Husson). 2 wins at 2, A$124,350, MRC Redoute's Choice S., L, 3d SAJC National S., Gr.3. Winner at 1250m in 2017-18 in Aust.